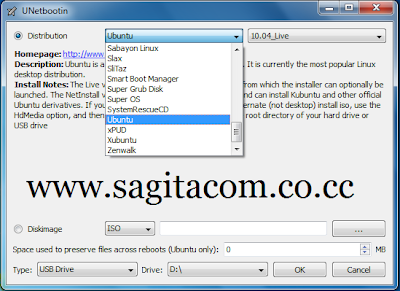 UNetbootin memungkinkan Anda untuk membuat bootable Live USB drive untuk Ubuntu, Fedora, dan distribusi Linux tanpa membakar CD. Hal ini berjalan pada Windows, Linux, dan Mac OS X. Anda bisa membiarkan UNetbootin men-download salah satu dari banyak distribusi didukung out-of-the-box untuk Anda, atau memasok sendiri file iso Linux anda. jika Anda sudah download satu atau distribusi pilihan Anda tidak ada dalam daftar. resulting USB drives are bootable only on PCs (not on Macs). UNetbootin can create a bootable Live USB drive, or it can make a "frugal install" on your local hard disk if you don't have a USB drive. 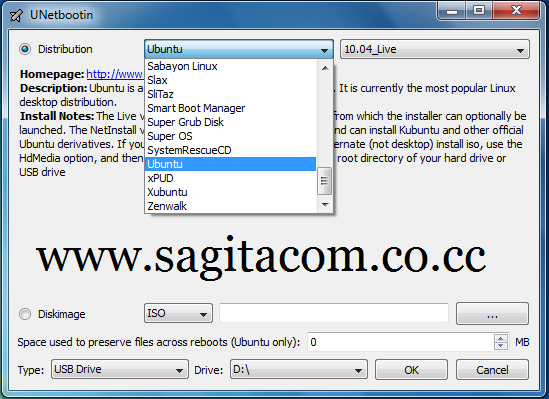 It loads distributions either by downloading a ISO (CD image) files for you. * Parted Magic, a partition manager that can resize, repair, backup, and restore partitions. * SystemRescueCD, a system repair, backup and recovery tool. * Dr.Web Antivirus, F-Secure Rescue CD, and Kaspersky Rescue Disk, which remove malware from Windows installs. * Backtrack, a utility used for network analysis and penetration testing. * Ophcrack, a utility which can recover Windows passwords. * NTPasswd, a utility which can reset Windows passwords and edit the registry. * Gujin, a graphical bootloader that can also be used to boot various operating systems and media. * Smart Boot Manager (SBM), which can boot off CD-ROM and floppy drives on computers with a faulty BIOS. * FreeDOS, which can run BIOS flash and other legacy DOS utilities.